Teresa Cooper is a 30-something wife, mom and teacher from Havelock, North Carolina. She has a Masters of Science in Education for Curriculum, Instruction, and Assessment from Walden University and a BA in Psychology with a minor in Creative from the University of North Carolina at Chapel Hill. Having struggled with anxiety and depression most of her life and later having birthed a child with autism, she is passionate about spreading awareness and acceptance of mental illness and autism and has been writing for Embracing the Spectrum since 2011. She also writes for The Mighty, The Huffington Post, and The Educator’s Room. Take a moment to think about this James Comer quote. No significant learning can occur without a significant relationship. In other words, learning is about relationships. But if that’s the case, we’d better get to work on that, right? Or does that relationship begin to build from day one? Can you change a relationship gone horribly wrong? I’d argue that you can, but you’d better be ready for some hard work and some tongue-biting. School leader Rita Pierson argues in her famous TED Talk that an essential part of our job as teachers is to support, encourage, and build relationships with our students. What’s in a good relationship? If you’re seeking first to understand, you start with the second statement. But you’re not perfect and sometimes you get rattled, which is why it’s important to have a thick enough skin to do something else once you initiate a verbal altercation unintentionally. Apologize. And Rita mentions in her video how off-guard students are taken when an adult apologizes to them. You may think that apologizing lowers your credibility in the eyes of the students, but I once had a student thank me for taking responsibility for when I make mistakes. You don’t have to bow down on your knees, but take the moment to come back to the student personally and say, “Hey. I think we both could have handled that better. I’m sorry that I…” and give it time. Don’t always expect immediate results, but be sincere about it at least. It may be a week and you may get a crumpled up letter in your seat, but I guarantee most students will reciprocate. The first job of any leader is to inspire trust. Trust is confidence born of two dimensions: character and competence. Character includes your integrity, motive, and intent with people. Competence includes your capabilities, skills, results, and track record. Both dimensions are vital. Don’t all students crave teachers who give it to them straight while demonstrating respect, creating transparent expectations, righting what’s wrong, remaining loyal to them (like, attend a game once in a while…), delivering positive results, striving to get better, confronting reality head-on, clarifying expectations (patiently), practicing personal accountability, listening first, keeping commitments (don’t say what you don’t intend to do), and extending trust? What a great guide! If they trust you, when you try to instill a growth mindset, there will be more buy-in, which means more achievement. Go to sports events to watch them play. Events can really build relationships. Say “hello” or “good morning/good afternoon” as they come to your door. Ask them about their day and listen and ask questions. Let them be right, even if you think they’re not, if it’s not that big of a deal. Listen when they talk. Really listen. Without doing anything else. They like to help. Let them. If you have a kid that’s always hungry, find a way to give him/her food. Randomly, without prompting, tell them you appreciate them for being themselves. Share their pain when they have it. Hold their proverbial hand, wipe their tears, and be their shoulder to lean on. See their potential and encourage them to pursue their dreams. 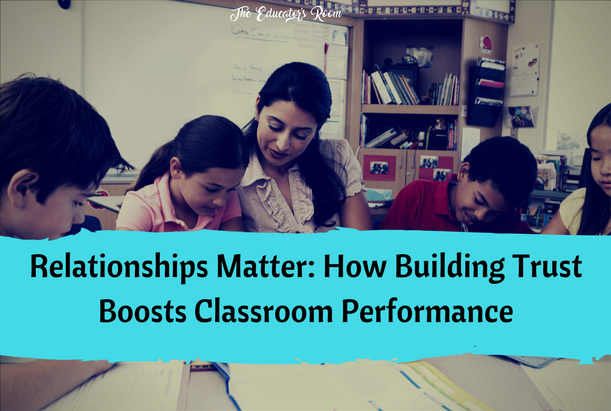 It’s like Rita Pierson says, “Every kid needs a champion.” Will you take the time to build relationships in the classroom? Whose champion will you be today?